The Teucer RGB remote KIT allows you to control one zone with RGB flex. 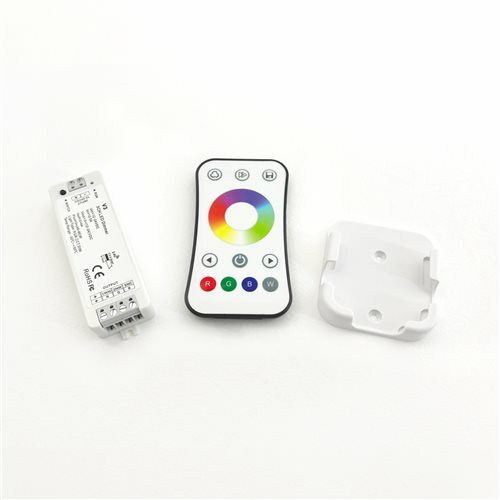 The RGB version comes with a touch colour wheel for different colour options and various effects, as well as dimming to a low 10% capacity. One receiver (R3c) is provided together with the remote to offer a complete and reliable solution. When expanding your lighting, always try and use a signal repeater (LEDPRRGBN), where possible. If your installation requires several RF receivers, ensure the �master� receiver is positioned in the middle. Please note that one battery CR2032s (included) powers the remote.